During my last eye exam, the doctor told me I have the start of cataracts. It could be years before I need to do anything about them, he said, but the news was a gentle reminder of the shortness of life, the kind of reminder the psalmist prayed would lead to wisdom of heart (Ps. 90:12). It also reminded me of my grandfather. Silas Neal gave me my first drawing lesson and introduced me to an artist’s way of seeing: Pay close attention to the details; don’t lose the perspective and proportion of things; and let your imagination look less with the head than with the heart. It was one of his most valuable and enduring lessons in life. Notice the small things; maintain perspective; see with the heart. For most of his life, Silas painted as a realist, creating dozens of pastels and oils of places in and around my hometown: houses, landscapes, scenes from his childhood. When he was in his nineties, after he developed cataracts, his style changed. He saw things differently, and his realism evolved into impressionism. Details softened and blurred; colors became brighter, more vibrant. There was more life in his paintings. 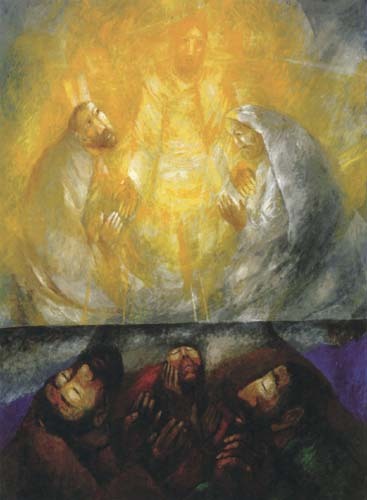 Those lessons return when I read the story of the transfiguration. Jesus’ transfiguration – the word is really “metamorphosis”; it’s what happens between chrysalis and butterfly – doesn’t fit our scientific way of thinking today: his face that shown like the sun, his clothes that dazzled the eye. It’s something we have to see with imagination, something that could never be captured by a realist, only by an impressionist. Picture the scene: a mountaintop, prayer, an overshadowing cloud, a voice from the cloud – elements of the usual settings for the closest communion with God. A few verses before, Jesus predicted his suffering and death and spoke about the profound costliness of following him (Matt. 16:21-25). Shortly afterwards, he reaffirms that he is going to be betrayed and killed, and three days later be raised (17:22-23). He’s at a critical turning point when, perhaps for the first time, he accepts death as the real and looming cost of the way of life he has chosen. Maybe here he commits himself at a deeper level to the journey of faith he has begun – a hard, self-sacrificing journey – knowing that on the other side is unimaginable joy and life without compare. He could have gone up the mountain that day and gone over the hill, settling for a life like everyone else, fitting into the world around him with hardly a second thought, going through the motions of life without ever really living. Or he might have gone ahead but half-heartedly, never risking himself totally and so never knowing the wholeness that comes with total commitment to God’s will. He could have remained quiet and unprovocative, active in his community and congregation, avoiding the struggle of hard choices that would shape his life of faith from day to day. Instead, he chose the rigorous, costly way of total commitment to his calling. He opened himself to his true nature, his God nature, uncovering the will of God that lay deep beneath his own will. And in that moment, in that choice, he was transformed, transfigured in the eyes of those around him, and he became his true, essential self, in all his fullness, in all his wholeness, in all his radiant glory. Others have made such a choice. Today we’re observing the Feast of St. David, patron saint of Wales, who died March 1, 589, at around 100 years old. David chose a hard and extremely austere life of voluntary poverty and extraordinary self-discipline, and in his death-bed message to his disciples he encouraged them to continue in the joy that had been his and that he had made known to them. Such joy came out of his difficult choice of lifestyle that today David’s name is stamped all over that part of the United Kingdom and around the world wherever the Welsh influence is felt. People still make that choice. In Sofia, Bulgaria, ninety-nine-year-old Dobry Dobrev chooses to live on a meager $100 monthly pension. People there know him as a saint, an angel, a divine stranger, a beggar. But Dobry isn’t a beggar; every cent he receives from others, he gives to help churches and orphanages to “build faith in a godly future” and “to build a benevolent [Bulgaria].” No one knows how much money has passed through his hands in his ministry, but it’s in the tens of thousands of dollars. There are moments when the direction of life can change, hinges on which the meaning of life swings. Eternity lies between our yes and no, in the choice between the path you walk and the path you leave behind. In those moments, the choices we make shape us and shape our destiny; they can transform us into the radiant people God has made us to be; and they can transform the very world we live in. When my cataracts get bad enough, I’ll have them fixed so I can see more clearly. I wonder if I’ll be able to see as clearly when I need to make the next defining choice in my life.